We focus on the termination qualities of our products - The ease, speed and efficiency with which our cable can be terminated. That's important because terminations are time-consuming and costly, and any savings of time and effort are profitable to those using TLC cables. Once in place, all TLC fiber optic cables offer the same, industry-wide, outstanding performance by using the industry leading components, such as Corning Optical Fiber. Terminating fiber optic cable is performed in either a manufacturing environment where speed, efficiency, and quality are the important factors or in field locations where hand tooling and environmental conditions add to the challenge. TLC has created products that strip cleanly and maintain a consistent diameter for crimping. 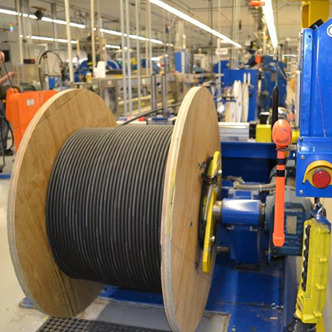 Cable must also offer all the performance benefits, including a buffer that is tight enough to support the fiber and a jacket that is flexible, but still able to hold the crimp on the connector. This was all started and achieved by partnering with a large customer who provided TLC with a termination laboratory for testing. TLC gets direct feedback of the important attributes responsible for the quality and performance of the termination process. This information applies to both our TLC cable and our competitor's products. Our focused approach has resulted in the production of a very high-quality product. Attention to these details has also made TLC a choice for special custom cable fabrication as well. TLC welcomes your custom colors, printing, customers supplied fiber, or other special features and constructions with small minimums and fast turnaround.